Testing of Apple's anticipated next-generation operating systems —iOS 8 and OS X 10.10 —continues along at a steady clip, new traffic data shows, ahead of the upcoming Worldwide Developers Conference, where both products are expected to be unveiled. 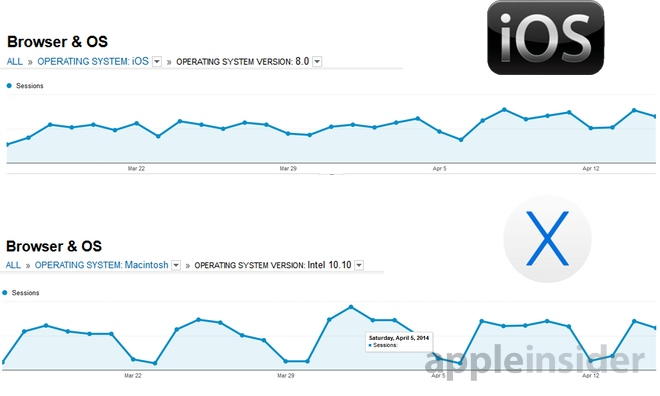 AppleInsider has been tracking traffic it sees from the next major versions of iOS and OS X, keeping an eye on trends as WWDC approaches its June 2 kickoff. While traffic from both Apple's mobile and desktop-class operating systems was steadily growing through late 2013, it's largely flattened out over the last month, traffic logs show. In a somewhat interesting pattern, traffic from devices running iOS 8 was largely steady regardless of the day of the week, with only small drop-offs on weekends. Macs running OS X 10.10, however, saw a significant decline in visits on weekends, reflecting the fact that those machines are probably used mostly at work. Traffic from Macs running OS X 10.10 was also higher than iOS 8 on peak days. The data suggests that Apple is hard at work testing out the next-generation versions of its iOS and OS X platforms, both of which are expected to be announced at an anticipated June 2 WWDC keynote. Apple took the same stage in San Francisco last year to officially unveil iOS 7 and OS X 10.9 Mavericks to its developer community and the public at large. In its WWDC 2014 announcement, Apple did reveal that the company plans to show off its "latest advances in iOS and OS X," stopping short of admitting that full-fledged point-zero releases will be shown off.